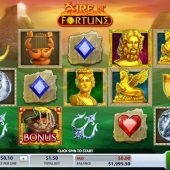 Fire n' Fortune slot is one of those increasingly rare games that made me want to play it as soon as seeing the intro screen, with the features offered and potential pays shown. I was further encouraged by the fantasy countryside background with the mysterious temple on a hill and the transparent reels with some well designed icons that didn't spoil my view. A soothing but meaningful classical music score plays as we spin bringing to mind some other adventure-based favourites of mine such as Castles in The Clouds and Age of The Gods: Prince of Olympus but will it be fire or fortune that's brought to bear on our bankroll here? A standard grid of 5 reels and 3 rows is covered by 15 pay lines with single symbols including the Phoenix Wilds which appear on all reels and are the top award of 800 coins for our 15-coin bet. There are also bonus Treasure Vase symbols too which only pay 50 coins for a full line but can be very beneficial with what they can bring as we'll soon see. The bust of the male God pays 200 coins, the female God or Winged Horse 100 coins, the Harp or Owl Coin 75 coins and Horn or Trident 60 coins for a full line. We also get card suits in the form of gems all paying 40 coins. I said the icons bar the Bonus are single, but on each spin there are stacks of mystery positions on each reel which are replaced by any game symbol including the Wild Phoenix. This brings us to our first 'Reel Copy' feature - when any full stack appears on reel 1 the Phoenix will set it afire and replicate it on two of the other four reels in a spectacular animation, then the remaining two reels will stop and hopefully match. You will obviously wish that the reels replicated should be 2 and 3 then you are at least guaranteed 15 of a 3-of-a-kind win! Now this where we see the benefit of our Bonus icons. You need 3 on any of the 15 pay lines to trigger 5 free spins, 4 to trigger 7 or 5 to trigger 10. If you are lucky enough to get multiple lines due to them coming in stacked via the Reel Copy feature then you get that amount of spins per paying line. So a full screen will award an incredible 150 free games - and it does happen! If you trigger the free spins with 15 or more you get an incredible choice offered you: you can take them all at 1x multiplier, or take 1/3 of them at a 3x multiplier or lastly 1/5 of the quantity with a 5x multiplier. In other words should you land the maximum 150 spins, you could take 50 with 3x or 30 with 5x applied. You can't retrigger them but some of you may have noticed that you could win an amount of free spins not divisible into a whole number by both 3 and 5, say 40 and 21 respectively. In this case you get the nearest whole number of spins and a bonus prize pick game to compensate you. 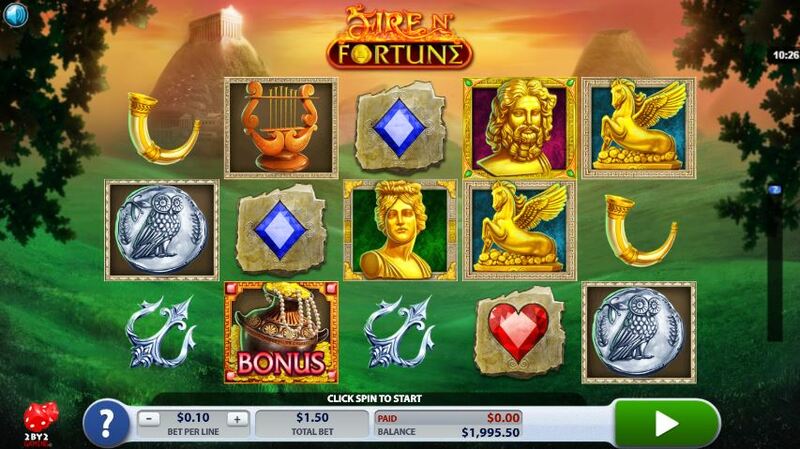 Fire n' Fortune slot is a stunning example of great graphics, animations and sound effects in one place. The game mechanic is very good with regular big wins via the Reel Copy feature and 2 By 2 Gaming have produced a stunner here in my view. You can also hit a full screen of Wilds for 800x bet and if you did this after selecting 5x free spins you could hit the game's top pay of 4000x stake or 60,000 coins. To complete the party we have a good RTP of 96.04% too - a game with big-win potential and a base game to sustain you, what more can a player want?